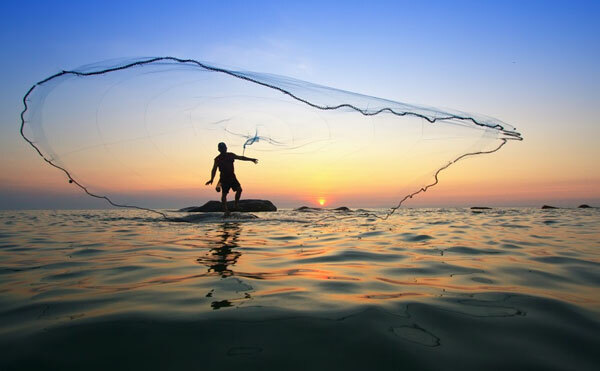 While some cultures cast nets for survival, others cast fishing nets to capture bait so they can enjoy fishing on their vacation. If you’d like to start using your own cast net to catch live bait, there are three things you should be concerned with when selecting the right net for your needs. Cast nets are designated based on the radius of the net itself before it opens. For example, a net with a radius of 10 feet will open to around 20 feet when tossed in the water. While you might think it’s better to have a large net to catch the most bait, it makes more sense to have a net that you can wield effectively. Large nets can be difficult to master for beginners. Nets come in child sizes like 3 to 4 feet up to professional fishing nets of 12 feet or more that can be customized. A good starter net for a beginner adult is 6 feet. This is a good size to bring on vacation too. The rope around the bottom of the net is called a lead line. This lead line has a certain amount of weights on it to cause it to open to the correct depth in the water. If you’re fishing in shallow water, you’ll want less weight than you would in open, deep water. With too much weight, your net will sink to the bottom quickly and can actually catch on the bottom. A good shallow water net will have approximately 1 and 1/4 pounds per foot. Nets for deep water will have almost 2 pounds per foot of weights. The mesh chosen for your net will depend on the type of bait you’re trying to catch. Tiny minnows will require tiny mesh. Mesh of 1/4 inch might be perfect for these types of bait fish. The nets can range from 1/4 inch to 1 inch in size. It will depend on the size of the bait you want. Surprisingly, large mesh will sink quicker too. This should be taken into account when choosing your mesh size too. You will also have a choice between nylon or monofilament nets. Monofilament doesn’t absorb water, and it has less of a chance to tangle. It’s also less visible when hitting the water, which will help you catch more bait. Overall, it’s the best choice. When choosing your cast net, make sure you’re picking the right material, weight and mesh size for a beginner. You don’t want to toss your cast net out and lose it because it was too heavy. While you’re not going to interfere with large mammals like this blue whale, it will disrupt the local environment to leave a net in the water.